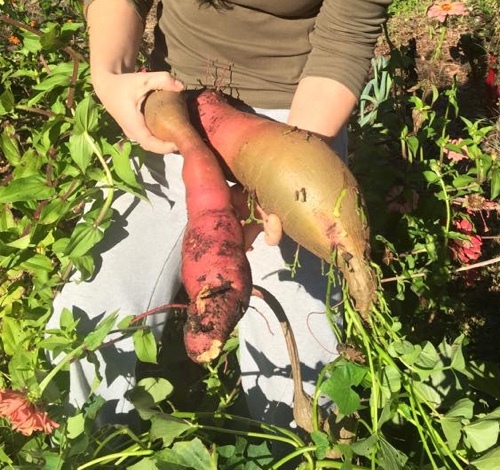 Remember last year, how I got that absolutely massive couple of sweet potatoes from my new hugel bed? They turned out great, sweet and not fibrous at all like I’d feared. So in case part of their massive growth was due to amazing genetics and not just the pond goop I’d topped the hugel with, I kept the top of the biggest. I decided to try and keep it alive over winter. 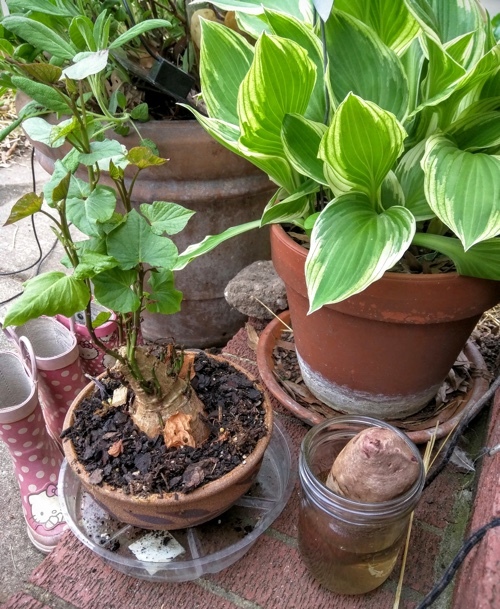 It sprouted a short little forest from its top and then just sort of sat around politely over the winter months doing very little. My calendar reminded me back in the middle of March that it was time to start sweet potato slips. Normally I just plunk a sweet potato (organic, so it’s not treated with a sprouting inhibitor) into some water and wait for it to root and start sprouting on its own. It takes a very long time. But since I’d overwintered the potato itself, I had already skipped both those steps. I decided to start one conventionally just for the sake of comparison. I set a sweet potato in a mason jar with some water and started waiting. The overwintered one was still patiently waiting with a head full of slips ready to go, while the standard one had just one measly little rootlet sticking out into the water and no slips at all. Overwintering saves so much time. 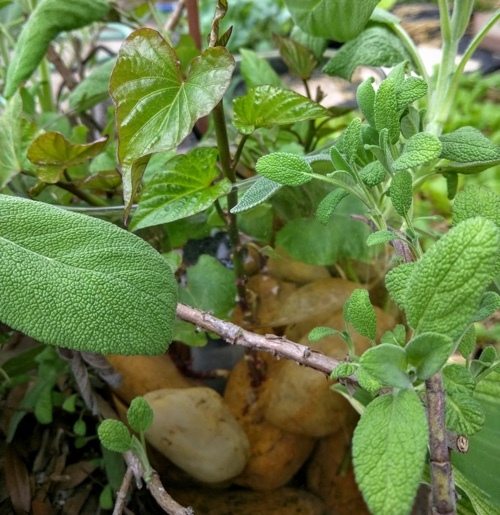 I went ahead and plucked off the ready slips from my saved potato and dropped them into the water of my little solar fountain. 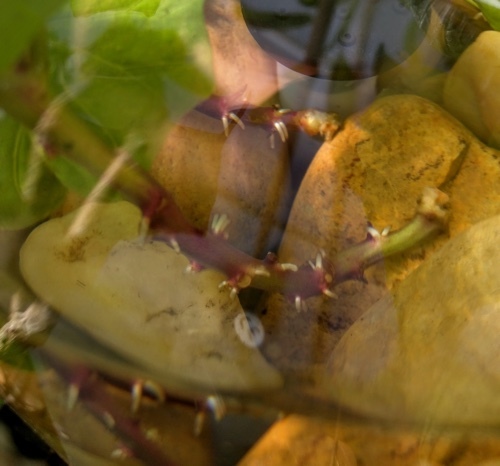 Each one will become its own separate sweet potato plant. Two days later they’re already rooting. I’ve always bemoaned how long it takes to sprout sweet potatoes, and how often I’m not ready by the time the planting window rolls around. Looks like I’ve found a solution, and one that lets me select for the genetics I want, too. Plus, the sprouted sweet potato looks kind of like an ugly little bonsai, doesn’t it? Pretty cool for a houseplant. This entry was posted on Sunday, April 3rd, 2016 at 2:07 pm	and is filed under garden & farm, how-to, sustainability. You can follow any responses to this entry through the RSS 2.0 feed. You can leave a response, or trackback from your own site. Just wanted to start following your posts. Found you via a post in FB about an old abandoned house, something I also have a great interest in. Love to imagine who might have lived there and what might have become of them. Atom, Entries (RSS .92), (RSS 2.0) and Comments (RSS 2.0). 29 queries. 0.238 seconds. Top.